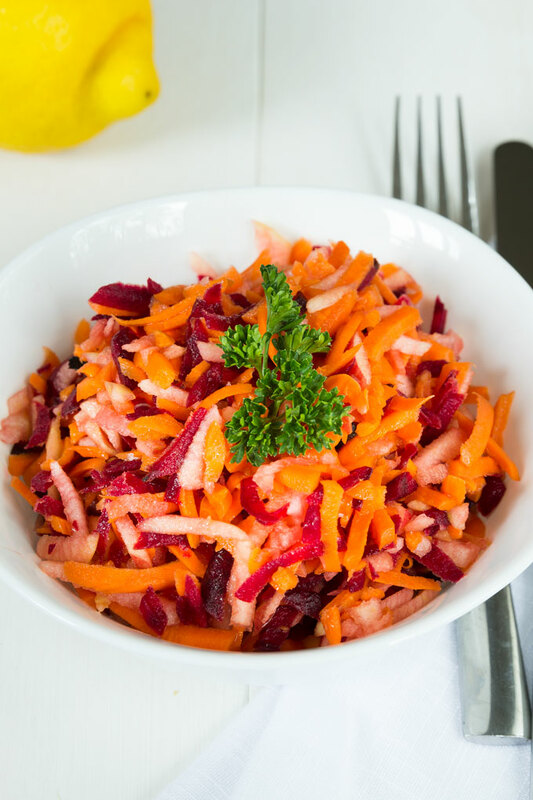 This Apple Beet Carrot Slaw simply bursts with flavor – earthy sweetness from the beets, tart sweetness from the apples, and a fresh zing from the lemon. 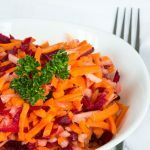 Although this Apple Beet Carrot Slaw may really only have three simple ingredients, it’s a whole lot of deliciousness. Often times bringing together just a few seasonal foods lets each component shine in its own beautiful way. Growing up I never really liked beets. I really had only seen them pickled with vinegar and sugar. Never had I seen them raw or with green tops. But then I became a teenager and got interested in nutrition and healthy eating. Whenever my mom went to the grocery store, I went with her to buy the foods I wanted to eat throughout the week. The produce aisle was where I spent most of the time. My mom would get the usual’s – apples, oranges, potatoes, onions, cucumbers, and tomatoes – and I would get the “unusuals”. Typically, I had a list of fruits and vegetables for recipes I wanted to try out that week. One of such recipes were roasted beets with walnuts. So, I got a whole bunch of fresh beets and headed home to prepare some beet goodness. As soon as I had the first bite, I was hooked. The beets tasted sweet and tender, nothing like I remembered from my childhood. So the next week I got some more beets and started juicing them (together with some apples and carrots) and it soon became my favorite juice. 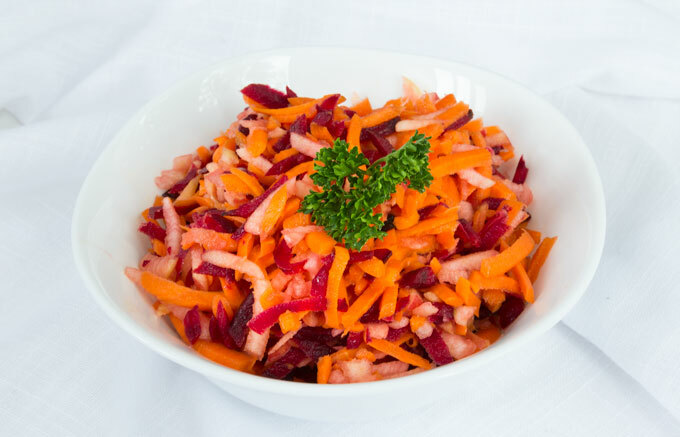 So, this recipe is inspired by the apple-beet-carrot juice, except that this time it’s a slaw. The idea behind this dish is to allow the vegetables do all the talking with minimal intervention from you. No canned beets or frozen carrots. If you wanna take this salad to yet another level, try to source a local produce that is also organic. That vibrant taste, the scent that just smells like summer — there’s nothing quite like local organic food. If you’ve ever prepared fresh red beets, you know that they can stain … well, just about anything. So, don’t mix all the produce at the same time or you’ll end up with red carrots and red apples. Surprisingly, the carrots retain their color quite well even after mixing with beets. However, the apples do not. So, fold in the apples right before serving. Finally, don’t skip the acid. Lemon juice, lime juice, apple cider vinegar … any of these acids give the apples a tart kick that wakes this salad up. The acid also prevents the apples from browning when you make this slaw ahead of time. Yes, you can make this salad ahead. It keeps well covered in the fridge for several days so it’s perfect for potlucks, parties, and holiday gatherings. If you’re not much of a salad person, try this vegan Caesar salad with chickpea croutons. It’s a refreshing spin on the old classic. This fresh and vibrant salad is full of flavor. 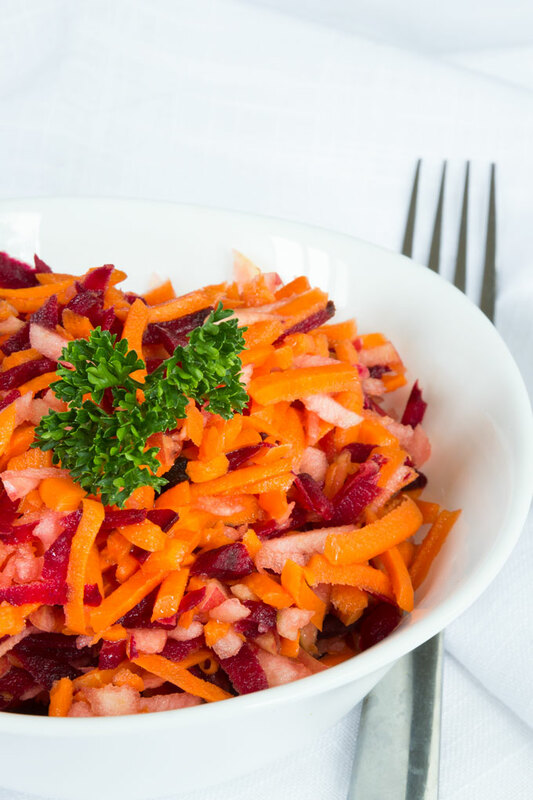 While this Apple Beet Carrot Salad features fall/winter-certifiable vegetables, its color and citrus-y flavor remind me of summer. It's kind of like a cross between a slaw and a salad. It's grounding, yet light. Whisk all the dressing ingredients in a medium sized bowl until emulsified. Using a mandolin with a 1/8" (3 mm) blade (or a standard box grater), shred all the produce. Mix all the ingredients right before serving. You can also top the salad with some fresh herbs, such as parsley or mint. Store leftover slaw covered in the refrigerator for a few days, though best within the first 24-48 hours. 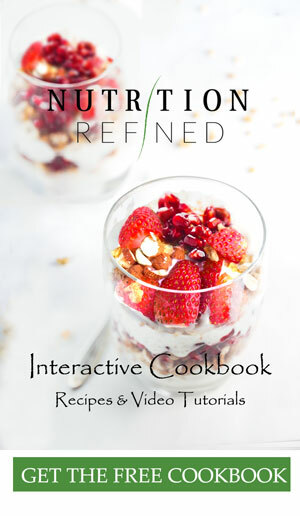 This recipe has been adapted from Joy McCarthy's book Joyous Health.